Last night we stayed over at Grandma and Papa's house because Uncle Jim is here from Michigan this week (and Daddy went to play games for the weekend). Cory had lots of fun playing with the puppies! This morning we went up to see Great-Grandma. She has tons of cool necklaces! 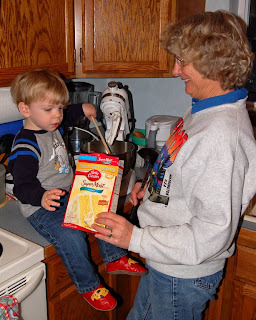 Then for dinner Grandma needed help making a cake! 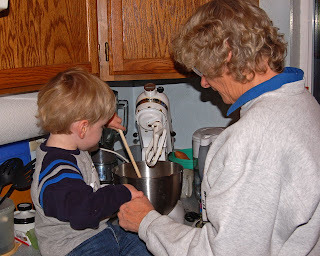 Cory is a good helper! 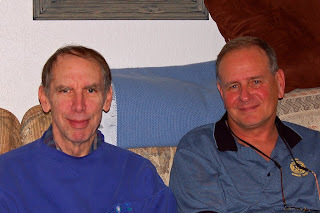 This is Great-Uncle Jim, Papa's brother. No, they don't look like brothers because technically they are step-brothers. But that was a really long time ago! Uncle Jim brought out a huge suitcase full of slides that my Grandfather had taken over the years. We had lots of laughs going back through them! Seeing pictures of Dad as a kid and realizing how much Kevin looks like him now (and when he was little, from what I remember). Oh, and there were pictures of my Grandmother. I don't know that I have ever seen any pictures of her. There were also some of my parents wedding. The pictures I have seen are really faded, but since these were slides they looked really good. That was cool! 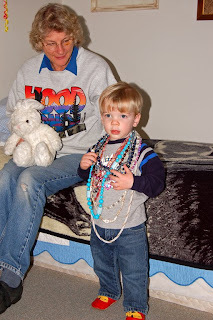 The Bean always wants to wear ALL of the necklaces and rings as well when she's dressing up. It's always neat to see little boys having fun with that before they start to care about such things. I remember my brother begging to have his fingernails painted pink when he was little. 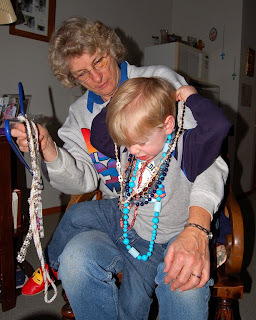 Too cute how he wants to wear all the necklaces :) He is very well loved by Grandma and Grandpa - it's sweet to see. hey im in town and want to know where you live!! e-mail me some good times to come and mess up your house,.. k!